Codman's latest addition: Sandra Cotterell, CEO of the Codman Square Health Center, left and Meg Campbell, executive director of the Codman Academy Charter Public School, outside the newly-opened William J. Walczak Education and Health Center on Epping Street. It’s a brand new four-story building with a strikingly familiar name. 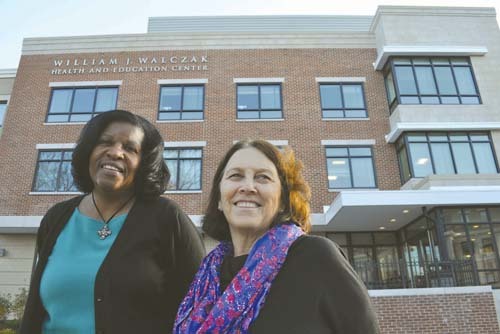 The William J. Walczak Education and Health Center — named for the founder of the Codman Square Health Center— is open for business – and classes. An official grand opening is on hold pending the return to action of the only other living Bostonian who gets his name on big new buildings these days – Mayor Thomas Menino – but the building itself has been in partial use since September and is due to be fully up and running by year’s end. The 34,000-square-foot addition to the existing Codman Square campus is a shared facility and a shared triumph. The two lower floors are largely the preserve of the Codman Academy Charter Public School, a 145-student high school that was spawned by the health center 12 years ago. The top floors of the Walczak wing are now coming into full use by the health center itself, which is relocating exam rooms and office space for physicians into the top levels. The school and the health center share certain common spaces, including a first-of-its-kind (in Dorchester) black box theater, a dining area, and outdoor garden space. The brick-and-stone building— designed by HRT architects— replaces two houses and one commercial building at the corner of Norfolk and Epping streets and is the first non-residential development of its size on Norfolk Street since the 1960s, according to city planners. The $18 million build-out, anchored with some $7.9 million in federal stimulus funds awarded in 2010, adds 22 exam rooms to the health center, including expanded space to convene a burgeoning “group visit” demand within the facility. The new footprint will also allow the health center to re-configure other space inside its older building, parts of which were renovated in the project. Sandra Cotterell, the CEO of the Codman Square Health Center, says that the newly combined space makes Codman the second-biggest health center in the city, after East Boston, and gives it the potential to host as many as 130,000 clinical visits per year in the coming 3-5 years. She hopes to grow the center’s patient base from 25,000 to 30,000 in that same time frame. Cotterell notes that the wing was designed to have larger spaces to accommodate a growing sector of the center’s care model: Group visits, in which multiple patients gather with one provider for meetings aimed at wellness, diabetes management, and pre-natal care. For Codman Academy, the space means a whole new learning environment. The school opened in a 2,500-square-foot corner of the health center in 2000. The students and faculty can now luxuriate in a footprint of more than 11,000 square feet that comprises two sparkling science laboratories and eight additional classrooms, all with windows that let in natural light and complement a running theme of “transparency” throughout the school. “This allows us to be the state-of-the-art high school that we wanted to be. It’s a seamless, open campus,” said Meg Campbell, the school’s founder and executive director, who expects that the already high demand for seats at the charter school will grow even higher as a result of the upgrade. Seats at the school are awarded by lottery each spring. The school had some 650 applicants last year, before moving into its new digs. Codman Academy is awaiting word from state officials on an application to expand their charter to include grades K-1 through 12. The lower grades, Campbell said, would be housed at another facility that has not yet been determined, but would be in close proximity to the Codman Square campus. If accepted, the expanded charter would allow Codman Academy to phase in as many as 200 new students to meet what Campbell says is a high demand for quality, lower-grade seats in this section of the city. The decision from state education officials is expected next February and Academy leaders are preparing to launch the new grades — K-1 and K-2, grade 1 and grade 6— next fall. “That’s what this community wants and needs,” said Campbell. One of the building’s more novel features is the first-floor black-box theater, which will be used alternately by the school and the health center for special events. The space, which can accommodate up to 160 people, will also be available for rent to outside groups by arrangement. The Dorchester Artists Collaborative hosted the first such event in the theater last month during its Dorchester Open Studios weekend. Students and teachers will undoubtedly be the principal users of the black box. Codman Academy, since its inception, has incorporated a vigorous arts curriculum into its four-year program, with an emphasis on spoken-word performances. The school has a longstanding partnership with the Huntington Theatre, which helps train students in theatre arts and poetry. All graduating seniors at Codman Academy must complete a “Socratic Apologia,” or a defense of his or her life, in front of a live audience. The Great Hall, which has been a key part of the Codman Academy campus, will continue to be used by both the health center and school, as well as for outside community events. Members of the Codman Square community, including Bill Walczak, the center’s namesake, got their first in-depth tour of the new facility during an open house on Sat., Nov. 17. Walczak departed as CEO of the health center in 2010 and was succeeded by Cotterell, who had previously served as chief operating officer for the center. Walczak, who remains active on the board of the foundation and is now employed at Shawmut Construction, was stunned to see his name on the building’s façade, a tribute his successor says is well deserved.